We have not to speak of the efficient cause of prayer. It is necessary for us to know, then, who can and who ought to pray. The question would soon be decided were we to say that all can pray and that all ought to do so. But in order the better to satisfy the mind, we shall treat this subject at greater length. In the first place we must realize that God cannot pray at all, since prayer is a petition which is made by grace and requires that we know that we are in need of something, for we are not accustomed to ask for that which we already possess. Well, God can ask for nothing through grace, but rather, he does everything by divine authority. Moreover, he cannot have need of anything, since he possesses everything. It is therefore quite certain that God neither can nor ought to pray. So much for what regards God. We find in some passages of scripture that the Holy Spirit has petitioned and prayed. (Romans 8:26-27) From this it ought not to be understood that he is actually praying, for being equal to the father and to the son, he cannot pray; but it means that he has inspired man to make such a prayer. The angels pray, and this has been shown to us in several passages of Holy Scripture. (Tobias 12; Revelation 8:3-4) But for people who are in Heaven, we have not so much testimony, because before our lord died, rose, and ascended into Heaven, there were no people at all in paradise; they were all in Abraham’s bosom. Nevertheless, it is quite evident that the saints and the people who are in paradise do pray, since they are with the angels who pray. Let us see now if all people can pray. I say, yes, and that no one can excuse himself from doing so, not even heretics.. Moreover, there was once a pagan (Acts 10:4, 30-31) who made a prayer which was so excellent that it deserved to be presented before the throne of the Divine Majesty; and God granted him the grace of the means of being instructed in the faith, and afterward he was a great saint among the Christians. It is true that great sinners experience great difficulty in praying. They resemble very young birds who, as soon as they have their feathers, are able to fly by themselves by means of their wings; but if they happen to perch upon birdlime which has been prepared to catch them, who does not see that this sticky substance will adhere to their wings so that afterward they will be unable to fly? Thus it happens to sinners – who so entangle themselves and settle into the sticky substance of vice, and so allow themselves to be stuck to sin, that they cannot soar to Heaven by prayer. Nevertheless, so long as they are capable of grace, they are also capable of prayer. It is only the devil who is incapable of prayer, because he alone is incapable of love. All that remains is for us to state the necessary conditions to pray well. I know indeed that the ancients who treat this matter cite a great many such conditions; some count 15, others, eight. But since this number is so large, I limit myself to mentioning only three. The first is that one be little by humility; the second, that one be great in hope; and the third, that one be grafted onto Jesus Christ crucified. Do you not see that nobles who wish to make water rise to the top of their castles go to the source of this water in some highly elevated place and then convey it by pipes, forcing it to descend for as great a distance as they wish it to rise? Otherwise the water would never rise. And if you ask them how they made it rise, they will answer you that it rises through this descent. It is the same with prayer; for if you ask how it is that prayer can rise to Heaven, you will be told that it rises there through the descent of humility. The spouse in the Song of Songs astonishes the angels and makes them say: “Who is this who comes from the desert, and who rises like a column of smoke, laden with myrrh and frankincense and with every perfume known, and who is leaning upon her lover?” (Song 3:6, 8:5) Humility in its beginning is a desert, although in the end it may be very fruitful, and the soul that is humble thinks itself as being in a desert where neither birds nor even savage beasts dwell, and where there is no fruit tree at all. Let us pass on now to hope, which is the second necessary condition for praying well. 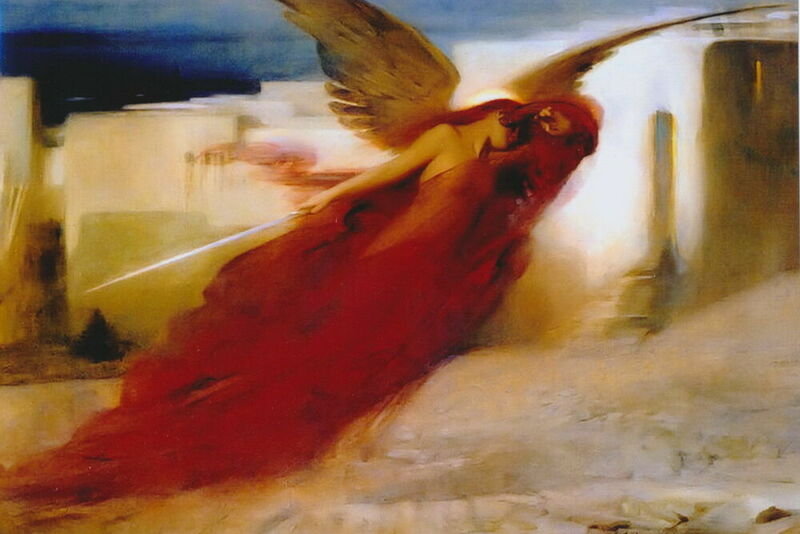 The spouse coming up from the desert rises like a shoot or column of smoke, laden with myrrh. This represents hope, for even though myrrh gives off a pleasant odor, it is nevertheless bitter to the taste. Likewise, hope is pleasant since it promises that we shall one day possess what we long for, but it is bitter because we are not now enjoying what we love. Incense is far more appropriate as the symbol of hope, because, being placed upon fire, it is necessary that hope be placed upon charity, otherwise it would no longer be hope, but rather presumption. Hope, like an arrow, darts up even to the gate of Heaven, but it cannot enter there because it is a virtue wholly of Earth. If we want our prayer to penetrate Heaven, we must whet the arrow with the grindstone of love. Let us come to the third condition. The angels say that the spouse is leaning upon her lover; we have seen that for the last condition it is necessary to be grafted onto Jesus Christ crucified. The Divine Spouse praised his spouse, saying that she was like a lily among thorns. She, in turn, answered him: “My lover is like an apple tree among the trees of the woods; this tree is completely laden with leaves, flowers, and fruits; I shall rest in its shadow and receive the fruit which falls into my lap and eat it, and having chewed it, I shall relish it in my mouth, where I shall find it sweet and agreeable. (Song 2:2-3) But where is this tree planted? In what woods will we find it? Without doubt it is planted on Mount Calvary, and we must keep ourselves in its shadow. But what are its leaves? They are nothing other than the hope that we have of our salvation by means of the death of the savior. And its flowers? They are the prayers that he offered up to his father for us (Hebrews 5:7); the fruits are the merits of his passion and death. Let us remain then at the foot of this cross, and let us never depart from there, so that we may be all saturated with the blood which flows from it. Saint Catherine of Siena once had an ecstasy while meditating on the passion and death of our Lord. It seemed to her that she was in a bath of his precious blood, and when she came to herself she saw her dress all red with this blood, but others did not see it. We, too, must never go to prayer without being similarly bathed; at least it is necessary to be thus bathed in the morning at our first prayer. Saint Paul, writing to his dear children (Romans 13:14), told them to be clothed with our Lord, that is to say, with his blood. But what is it to be clothed with this blood? Do you not know that we say: There is a man clothed in scarlet; and scarlet is a fish. That garment is made of wool, but it is dyed in the blood of the fish. In like manner, even though we are clothed with wool, by which it is understood that we perform good works, these good works – though from us – have neither worth nor value if they are not dyed in the blood of our master, whose merits render them agreeable to the Divine Majesty. When Jacob wishes to obtain his father, Isaac’s, blessing, his mother made him prepare a kid in venison sauce because Isaac liked it. (Genesis 27:9-29) she also made him wear the skins of the kid on his hands, because Esau, the elder son to whom the blessing belonged by right, was all hairy. She even made Jacob wear the scented garment destined for the eldest son of the home. She led him thus to her husband, who was blind. 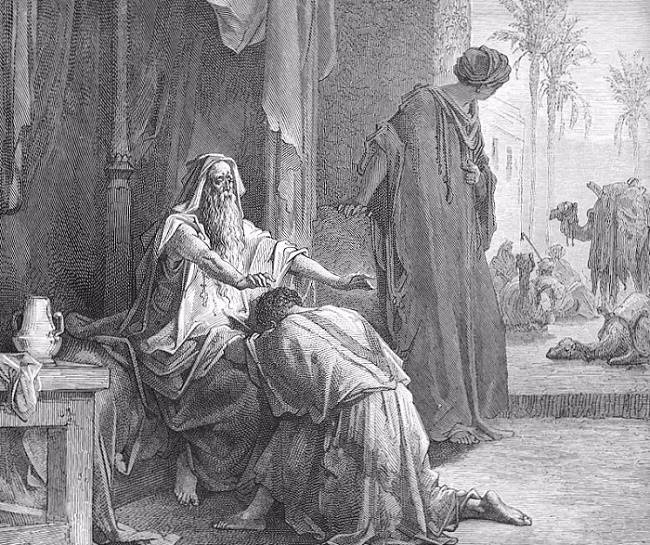 When Jacob asked for the blessing, Isaac felt his hands and cried aloud: “Ah, but I am in such pain! The voice I hear is that of my son Jacob, but the hands I feel are those of Esau.” And having smelled the scented garment, he said: “The good fragrance that I have savored has given me such delight that I give my blessing to my son.” So too we, having prepared this spotless lamb (1 Peter 1:19), and having presented him to the Eternal Father to satisfy his taste, when we ask for his blessing he will say, if we are clothed with the blood of Jesus Christ: The voice that I hear is Jacob’s, but the hands (which are our evil deeds) are those of Esau; nevertheless, because of the delight with which I savor the fragrance of his garment, I give him my blessing.